Do you know where the food you eat comes from? Some people in northern Minnesota are making sure they know the answer. They're eating only the food they can find that's grown within 250 miles of where they live. They say eating locally produced food is healthier, and it helps the local economy. Mahnomen, Minn. — Stephanie Williams says she doesn't miss those twice-a-week trips to the grocery store. She rarely needs to go to the grocery store these days, because she has several months of food stored at home, and nearly all of the food comes from within a 250-mile radius of her White Earth home. Williams is extension service coordinator at the White Earth Tribal College in Mahnomen. On a blustery winter day mouth-watering smells fill the tiny, cluttered office. Three people who work in this office are part of a group of seven who have challenged each other to eat only local foods for a year. Williams lifts the lid from kettle simmering on the stove in the office kitchen. She's preparing the dish for a potluck at the tribal college. The goal is not for this to be a self flagellating cult of some kind. We want to make this something people can do and not feel like they're suffering or sacrificing. "Those are calypso beans from an organic farmer in Park Rapids," explains Williams. "The pork came from Eagle View farms in Ogema. The garlic came from Turleys. The spice mixture is called McGee, it's from a local woman in White Earth that makes this incredible spice mixture. That's what I'm having." Williams says it's easier than she expected to find plentiful food locally. Many farmers sell meat direct to consumers. Pasta, flour and sugar are regionally produced, and it's been easy to find locally grown wild rice, potatoes, vegetables and even things like garlic and mushrooms. The diet is not only based on local foods, it's also dependent on seasonal foods. Fresh vegetables and fruit are eaten only in the summer, and they're canned or dried to use the rest of the year. Each person is allowed 12 items from outside the region in their diet. They call these trade items, and they can include things like salt and pepper, olive oil, coffee and chocolate. Stephanie Williams says since she started eating exclusively local food, she's eating more nutritious food, spending less money on groceries, and not devoting as much time to preparing meals. "During harvest time of course there's a lot of work to do, but now, we just sit around and eat," says Williams with a laugh. "When I make a soup, instead of having to go to the store and buy the produce, it's already dried so I just reach my hand in the jar and throw it in. So it takes me five minutes to prepare a soup which is really healthy and is more or less a gourmet meal," says Williams. 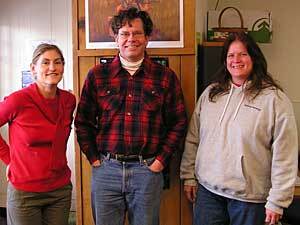 Stephanie Williams, Steve Dahlberg and Sunny Johnson all work at the White Earth Tribal College. They're part of a group of seven people who came up with the idea after talking about ways to encourage people to eat more nutritious foods. Sunny Johnson says the food is great, and so is the new sense of community built around food. "We get together and we have a tomato fest where we can tomatoes for 18 hours and then it's done. And then we've got our winter supply," explains Johnson. "We make butter for two days straight and our arms are all sore afterwards, but we've had a great time together and we're not going to be doing it for several months after that." "Sitting down at every meal it's like, 'oh, this is what we did when we got the venison, and this is what we did when we canned the tomatoes,'" adds Stephanie Williams. "The laughter comes back, and the memories. Everything that's in front of us we know where it came from, we know who touched it, we know who made it." Stephanie Williams lives at White Earth. Sunny Johnson lives in Bemidji. Steve Dahlberg commutes from Fargo- Moorhead. They all have busy schedules, but they say they've made food a priority in their lives. They've all found different sources of local food they share. They gather wild plants and fruit for added variety, and they've discovered some grocery stores are putting more local food on the shelves. White Earth Tribal and Community College math and science professor Steve Dahlberg says their local food challenge is getting a lot of attention. He thinks many people are like he was, a little uneasy about where their food comes from. "I've got kids and I'm always concerned when I'm buying something from the store, 'What's in there that I don't know about?' Here I can just feel a lot more comfortable because I know exactly what's in that food," says Dahlberg. It's not an inflexible regimine. His kids still eat fast food sometimes, but at home his whole family eats locally grown food. Dahlberg says started with what he calls baby steps, adding locally grown foods one at a time. "The goal is not for this to be a self flagellating cult of some kind," says Dahlberg. "We want to make this something people can do and not feel like they're suffering or sacrificing. That doesn't serve any purpose." Steve Dahlberg, Stephanie Williams and Sunny Johnson say eating local food will be a permanent lifestyle change for them, and they hope to encourage others to create their own version of the local food challenge.